What Does It Takes To Run A Sewing Business? The dream of many of us who sew is to one day run our own sewing business. Running any business is a major undertaking. The business of sewing is no different. Where to begin? The type of business that is chosen should take into account the sewer’s level of knowledge and skills in a particular sewing area. Preferences in the type of business should be considered, after all this is your chance to actually do something that you enjoy. One of the first things that has to be decided is whether one will teach sewing or sew for others. If the decision is to teach sewing, one has to ask oneself if the teaching will be as a private instructor or in a school. What type of clientele will be taught? Will it be adults or children or both? If sewing for others one should ask the question, what type of sewing will it be? There are many avenues of sewing for others. If sewing for others, one can pursue fashion sewing, sewing for weddings or even home décor either as a home based business or as a commercial business. Do you have a sewing business or want to start one? Click here and share your story. As a sewer, one may prefer quilting. There is also the opportunity to make quilts or even quilted clothing by sewing machine or even using a longarm machine. One can also concentrate on machine embroidery either as a home embroiderer or as an industrial embroiderer perhaps embroidering t-shirts or caps for sports teams or schools. If setting up a home based sewing business and one has a family, what effect this will have on the family must be considered. Other questions arise such as how much will it cost, especially if equipment will need to be purchased or rented or if space must be rented, what laws are involved, what accounting and tax requirements must be considered? What type of liability insurance will be needed? No matter what form one's sewing business takes, whether it's sewing for others or teaching sewing, machine embroidery, longarm quilting, sewing machine repair or any other sewing related endeavour, the goal is to provide great service to the customers as well as earn a profit. 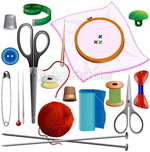 The sewing industry is also one that is well suited to promotion on the web. Here is a great tool for those who are considering setting up a sewing business and who want to maximize their customer services as well as their profits. This free e-book is called The Service Sellers Masters Course and it's great reading and can help anyone who wants to improve the services that they provide to their customers or anyone thinking of creating their own website as another avenue to promote their sewing business or any type of business. Click on the book icon to find out what's in the e-book or on the link below. Do You Have A Sewing Business Or Want To Start One? Do you have a great sewing business or want to start one? Please share your story with us about your existing sewing business or starting a new sewing business. Tell us what has been your biggest fear in starting your business. Tell us what has been your greatest triumph. Share some of your tips for starting a sewing business or staying in business.